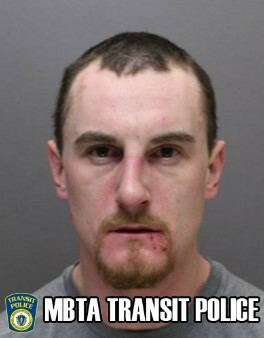 tpdnews: Brighton man arrested for Assault at Green Street Station. Brighton man arrested for Assault at Green Street Station. On March 27, 2019 at approximately 7AM Transit Police officers assigned to the South District received a radio call to respond to the MBTA's Green Street Station for a report of an assault. Upon arrival officers were informed of the following: the victim, a 31 year old male, prior to entering the station noticed an unknown male, later identified as David Joress, 30, of Brighton place a face mask on and sternly glare at him (Victim). The two males exchanged words relative to the alleged glare. The victim proceeded to the inbound platform to wait for his train. At this time Joress with a closed fist struck the victim on the side of head knocking him into the pit/right of way area. According to the victim the assault rendered him temporarily unconscious. The victim, who fell approximately five feet into the pit from the assault, was transported to a local area hospital to be evaluated. Joress was placed into custody and transported to TPD HQ for the arrest booking process.